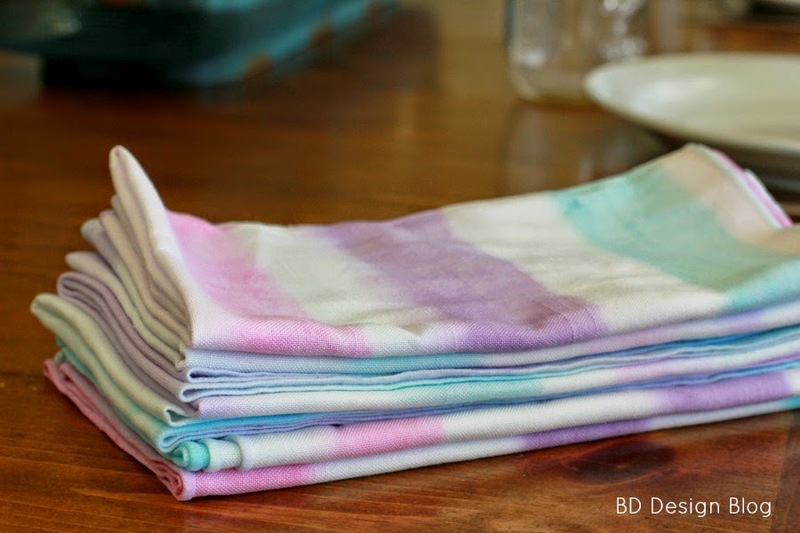 Let’s Tie Dye Your Summer with these fun little DIY colored napkins. It’s the perfect way to liven up your table! Thanks to Tulip One-Step Tie Dye and Blueprint Social for this sponsored post. All opinions are my own. Summer to us means fun, relaxation, and friends! 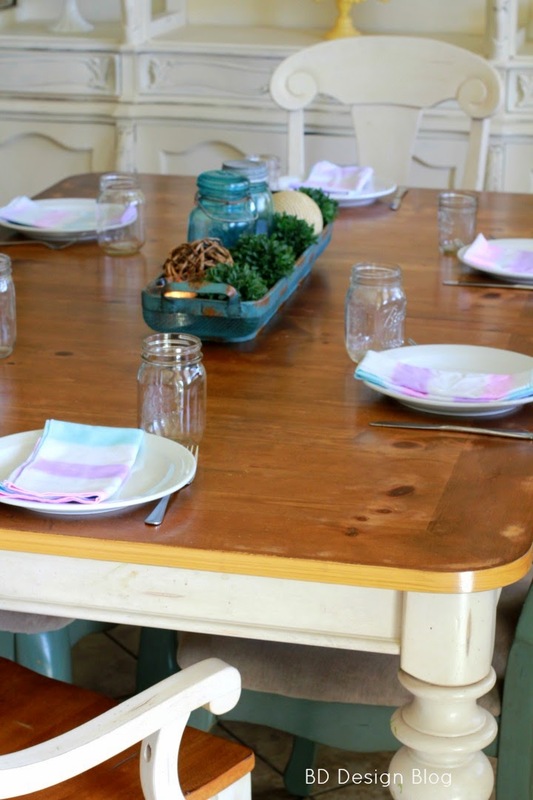 What better way to mix the two then host a summer dinner party for your friends. The table decor should also match that philosophy! You don’t want to be spending hours cooking AND decorating so make your decor simple but beautiful. – 1 bottle each of the Tulip One-Step Tie Dye in the colors of your choice. If you want your striped to be more define start out with dry napkins. If you are wanting more of a softer look then start out with wet napkins. I wanted a softer look so I put my napkins under the kitchen faucet to make them wet. But it’s totally up to you and what desired look you are going for. 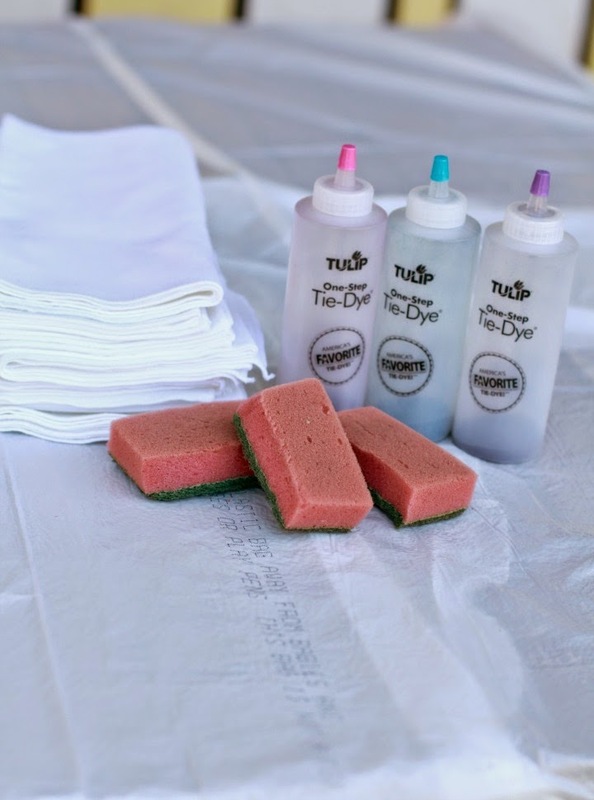 Apply the colors to the end of the cut sponges and swipe across the napkin to create your stripes. Make sure you use one sponge for each color and don’t mix. Let the dye sit on the fabric for about 30 minutes then rinse with warm water until the water runs clear. If you want well defined stripes, rinse really well at this point. If you want softer stripes with a muted background, rinse them gently but don’t worry about getting to the clear water point. 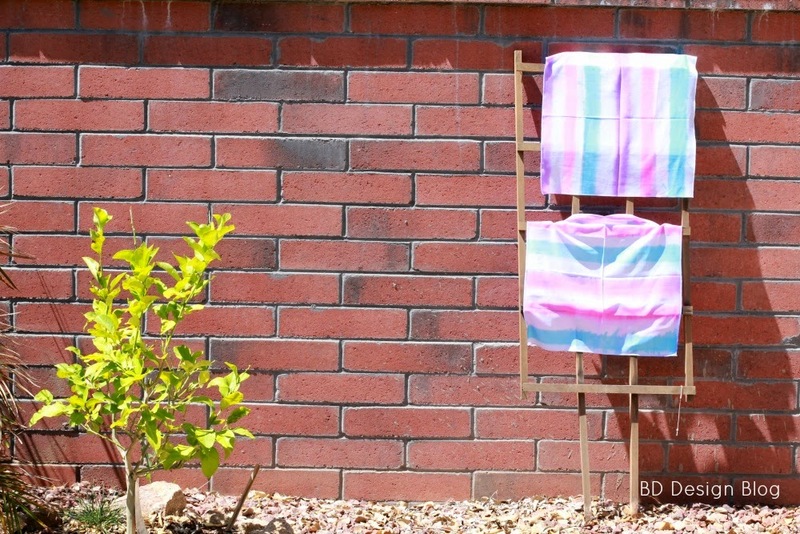 Hang to dry if you want more defined stripes. If you don’t, skip this step put them directly into the washer. Run them through the washer with the hottest temperature the fabric will allow with a tiny drop of laundry detergent. Tumble dry and fold. The color will be totally set so you don’t have to worry about getting color on your guests at your next dinner party! Here’s the end result! Ta-da! Time to start planning the next dinner party! 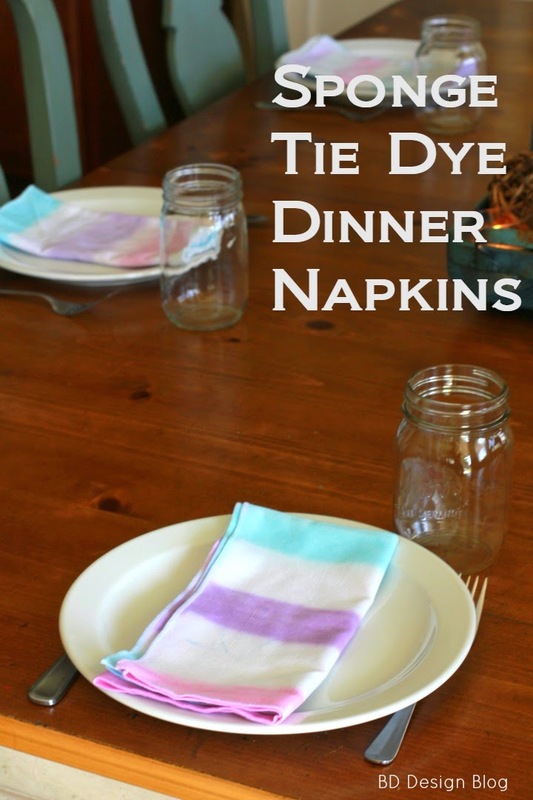 These napkins were so much fun to make with the Tulip One-Step Tie Dye. This is my first project using this project that I didn’t expect it to be so easy and mess free. The whole time I was doing this project I kept thinking how much my girls would have loved to be right by my side helping me. With the powder already inside the bottles, it makes for an easy and mess free project. Those are super cute! It looks like something I could do with the kids, as well. I love these napkins! I have never thought of using tie dye for anything but tshirts. Your table setting it beautiful. Oh my, this is so cool! 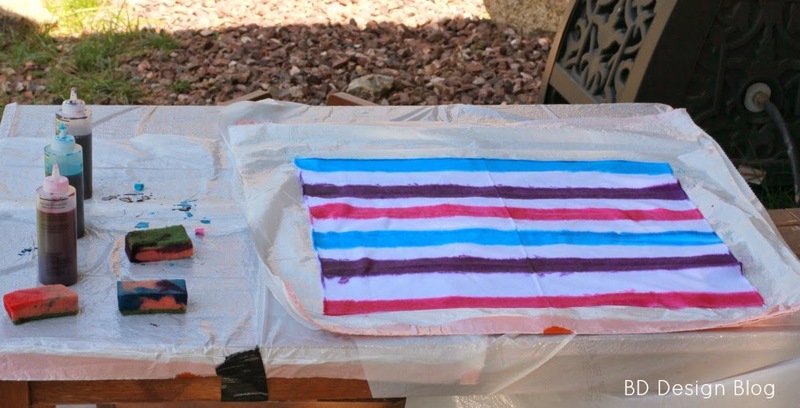 I have never tie-dyed like this…I am loving the stripes and the simplicity of this project. Love it. btw…you look like the girl from Veronica Mars…kinda sorta. First off, your colors are perfection! Secondly, this is such an awesome project that could be tailored for any special event! What a cute project. I love the colors you chose! The napkins look so nice against those plates.